Chrystal Every Thomas found our plaster stencils and went to town on her Craigslist furniture finds. 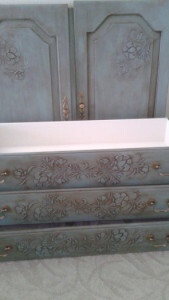 Chrystal found this chest on Craigslist and gave it a make over using our Raised Plaster Marcelle Border Stencil. 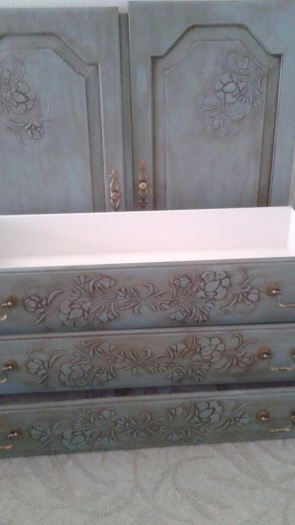 She shows us how the full border can be used across the fronts of the drawers and then how a portion of the design can be taped off (to create a smaller design) and used in the corners of the doors. This is a truly “designer” look and Chrystal obviously is a “designer” in her own right. 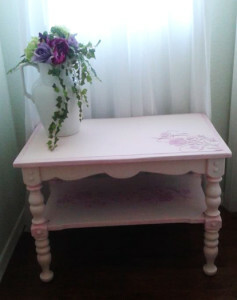 Using the same plaster stencil design, she did a make over on this cute little table as well. 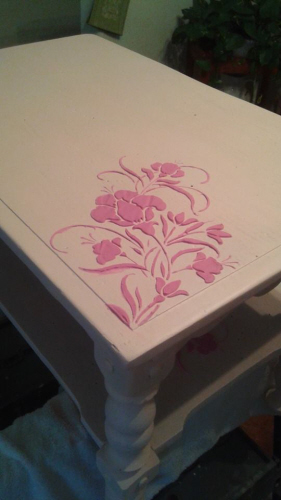 She used the design in just one corner, pre-tinting the medium pink. Now how precious is that???? Thank you Chrystal! We are officially “in love”!